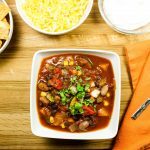 Healthy version of chicken chili made in a crock pot! Slow Cooker Green Chili Chicken is hearty with a hint of spice. Serve over rice or wrap in a tortilla! 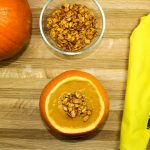 Weight Watchers friendly recipe- 3 SmartPoints! I sure do love crock-pot meals… who doesn’t! You put the ingredients into a crock-pot, set a timer, and walk away. It’s a win-win situation. You will see a lot of these meals from me in the months ahead because I love making chilies, soups, stews, etc. There are so many different variations of chilies and stews that will keep me a busy lady in the winter. 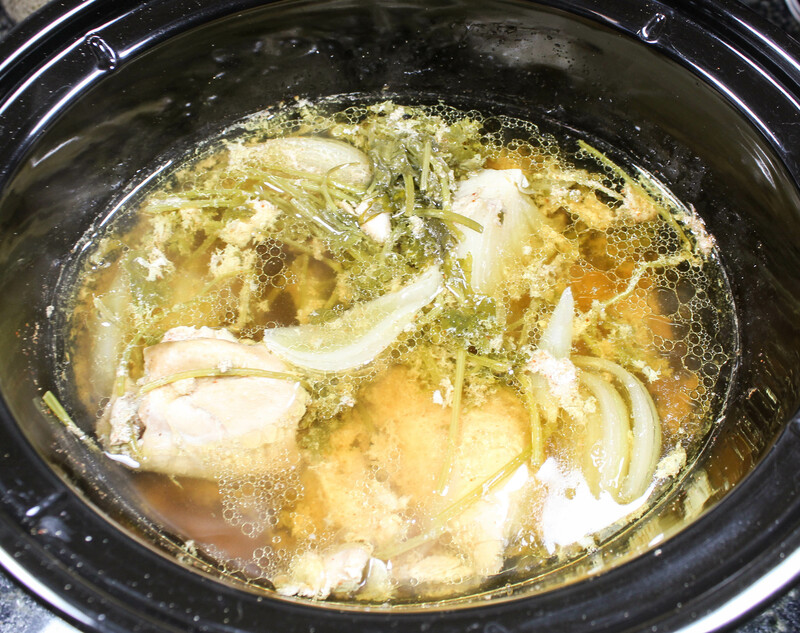 To brush off my crock-pot and put it to good use in my NEW kitchen, I recently made Slow Cooker Green Chili Chicken. This chili is healthy and hearty! 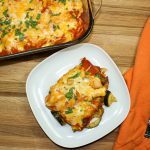 This is a Weight Watchers friendly recipe and it’s 3 SmartPoints per serving. I had the inspiration to make this because I was craving white bean chicken chili but didn’t really want a super heavy meal. This dish is very similar with the same flavors but doesn’t have all of the liquid. There are a million different types of chilies and stews. Too many to even remember! You could say that I’m prepping myself to be eating a lot of chilies and soups now that I live in Indiana (where it snows!) and not Texas :). One of the many pleasures in life is eating a nice, hot bowl of chili on a cold winters day. I can’t wait for winter to get here! For Slow Cooker Green Chili Chicken, I use chicken thighs to change things up rather than using chicken breast. I really like cooking with chicken thighs because they are moist and really retain a lot of flavor from the chicken broth. To the crock-pot, add chicken thighs, water, one bunch of cilantro stems, garlic cloves, and a quartered onion. Cilantro stems add great flavor to the chicken and you will use the leaves later for the sauce; just take the bunch that you buy at the grocery store, wash it, remove the leaves, and tie the stems together. You could totally do all the prep work for this meal the night before, then in the morning dump everything into the pot and let it cook on low for 8-10 hours. Once the chicken is cooked, remove from the crock pot and shred. The chicken will be so moist and tender it will be SUPER easy to shred. Be sure to save the flavorful liquid from the crock pot, the garlic, and the onion. Nothing should go to waste!! While the chicken is cooking, the sauce can be made. 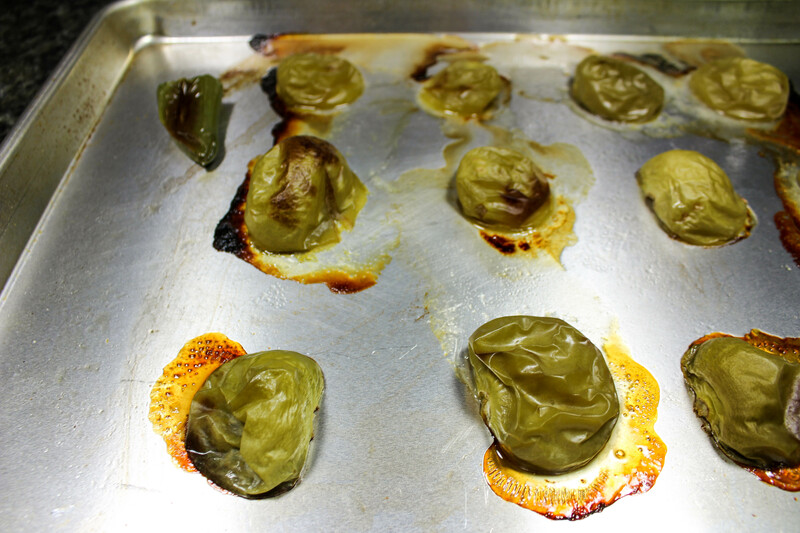 To make the sauce, roast tomatillos and a jalapeno in the oven at 450 degrees for 25 minutes. Once they have cooled enough to handle, remove the skin of the jalapeno. To a food processor (or blender), add tomatillos, jalapeno, canned green chilies, white vinegar, cumin, honey, seasonings, and the leaves from the cilantro bunch. The sauces is sweet with a hint of spice. Next, into a large pot pour the tomatillo sauce and add in the shredded chicken. Dice up the left over onion and garlic that was cooking with the chicken and add to the pot. This will really turn up the flavor a notch! Add canned white beans and 1 to 1 ½ cup of the crock pot liquid and let the chicken simmer for about 15 minutes. I like to serve this over cooked brown rice and garnish with fresh avocado, pico de gallo, and queso fresco, but you can serve this over anything or by itself!!! 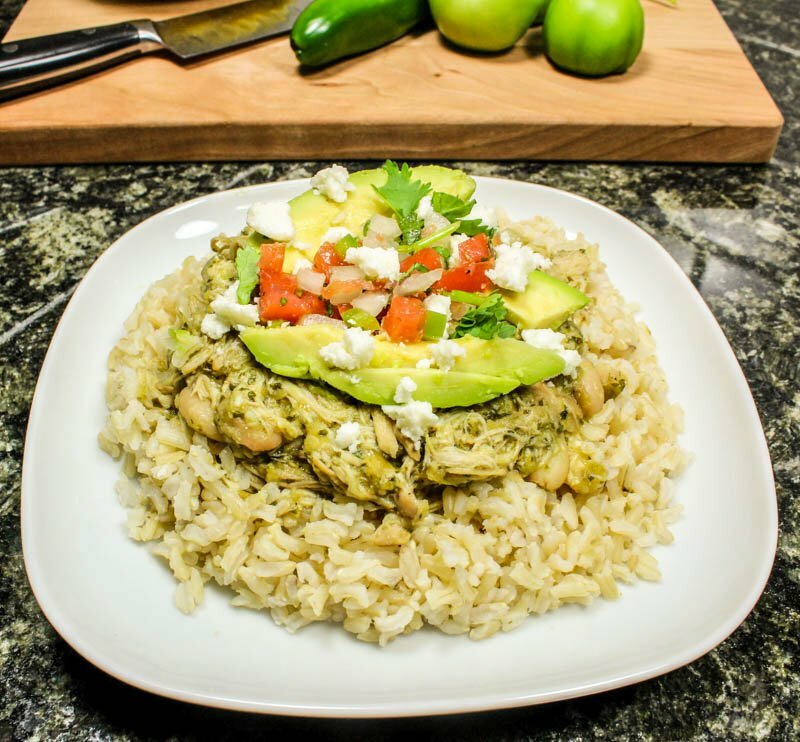 Slow Cooker Green Chili Chicken is full of flavor, hearty, and healthy. The only bad part is that you’ll wish you would have made a double batch to eat for left overs! I hope you enjoy these *chili* bites of flavor! Remove stems from cilantro and tie together; save cilantro leaves for future use. Dice onion into 4 chunks. In a crock-pot, add water, chicken thighs, cilantro stems, onion and garlic. Season with cumin, chili powder, salt, and pepper. Remove chicken and shred. Set aside. Save liquid from crock pot and save onion and garlic. Dice onion and garlic and set aside. Spray a baking sheet with non-fat cooking spray. Remove husk from tomatillos, wash, and cut in half. Place tomatillos onto baking sheet with cut side face down. Lay jalapeno onto baking sheet. Roast tomatillos and jalapeno in oven for 25 minutes. Wrap jalapeno in foil to let it “sweat” for about 10 minutes (to make it easier to remove the skin). Remove the skin of the jalapeno. Transfer tomatillos, jalapeno, cilantro green chilies, white vinegar, cumin, chili powder, honey, salt, and pepper to a food processor (or blender). Mix until well combined. 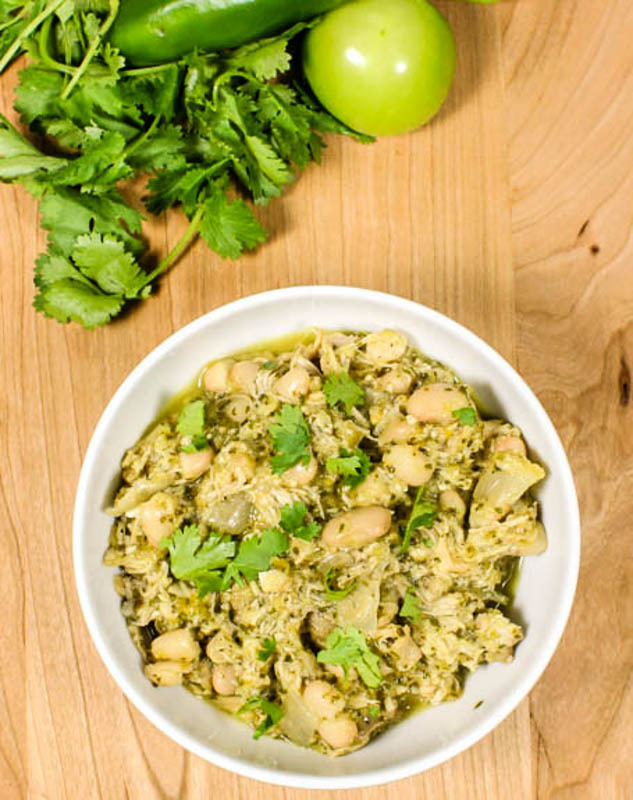 In a large pot, add tomatillos sauce from food processor, shredded chicken, diced onion and garlic (left from the crock pot), and white beans. Add 1 to 1 ½ cup of liquid from the crock pot white beans. Serve over cooked brown rice and garnish with chopped cilantro, pico de gallo, avocado and cheese if desired. 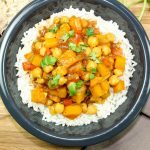 This recipe is freezer friendly! I like to serve this over brown rice. I did not add brown rice to the Weight Watchers nutrition calculator. August 25, 2016 at 3:32 pm It IS amazing Erin! Make it for your next date night :)!